The first major film to bring to life the post-World War II struggles of Mexican Americans against the Jim Crow-style discrimination targeted against them, A Class Apart is built around the landmark 1954 legal case Hernandez v. Texas, in which an underdog band of Mexican Americans from Texas bring a case all the way to the Supreme Court – and win. The story begins with a murder in a gritty small-town cantina and follows the legal journey of the Hernandez lawyers through the Texas courts and ultimately to the United States Supreme Court. 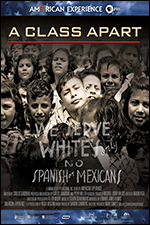 We see the lawyers forge a daring legal strategy that called their own racial identities into question by arguing that Mexican Americans were “a class apart” who did not neatly fit into a legal structure that only recognized blacks and whites. A grassroots national movement supports the legal efforts, with tiny contributions sent by Latinos from around the country paying for the Hernandez case to go forward. The film dramatically interweaves the story of its central characters – activists and lawyers, returning veterans and ordinary citizens, murderer and victim – within the broader history of Latinos in America during a time of extraordinary change. Soon to be a major motion picture Executive Produced by Eva Longoria’s UnbeliEVAble Entertainment! Marci Juett, Media Transcripts, Inc.
in association with Latino Public Broadcasting (LPB for American Experience. This program was produced by Camino Bluff Productions, Inc., which is solely responsible for its content. © 2009, Camino Bluff Productions, Inc. All Rights Reserved. Beyond the Barcode Productions, M.